Water Jet Cutting Machines . . . Huge Advantages! Waterjets offer huge advantages! What are they? How will they save me money? Water Jet Cutting Machines have many advantages over other cutting methods. Water Jet Cutting is considered a cold cutting process. Because of this, it does not create an Heat Affected Zone. What are the advantages other than “No Heat Affected Zone”? Many, to name a few. . .
Water jet cutting machines are great for “fast turn-around” projects. They are easy to program and cutting setup is fast. No G codes! Simple. . Simple Simon. Also, I can cut up to a hundred feet per minute. Of course the speed of the cut depends on many variables. 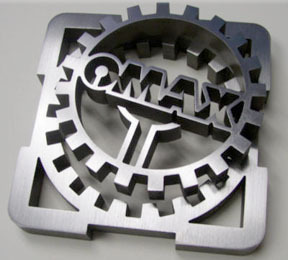 With water jet metal cutting, thinner materials can be stacked and cut with one pass! Kaching! Kaching! Can you hear the savings? Waterjets can pierce most materials without pre-drilling. Some laminates are an exception because of the tendency to delaminate. Still, I don’t have problems cutting laminates, just piercing them. I am only limited by my imagination, and the .030 jet kerf for a .015 inside radius. Efficient nesting of parts and small kerf produces material savings, i.e. money savings. Bolster the bottom line. Kaching! Kaching! Water jet cutting machines, depending on the thickness of the material, can typically hold +- .003 of an inch, and some models can hold as tight as +- .001 of an inch. This is adequate for most applications. I control the quality of the cut! By slowing down the cutting, I can eliminate the need for secondary edge processes, such as sanding and grinding. Looks like a sand blasted edge. Come to think of it, it is a sand blasted edge! Kaching! Kaching! There’s the sound of savings again! Water jet cutting requires less energy than most other similar processes. Kaching! Kaching! Most cutting is done under water. Unlike many other cutting processes I am not concerned with loud noise, dust particles, or fumes that are harmful, and I don’t need cutting oils. Water Jet Cutting Machines provide exceptionally accurate cutting for an extensive range of materials.